RhineBuzz: RhineBuzz Tours at the Tonhalle "The Suspicious Saxophone - Degenerate Music During the Nazi Regime"
RhineBuzz Tours at the Tonhalle "The Suspicious Saxophone - Degenerate Music During the Nazi Regime"
75 years ago Düsseldorf hosted the ‘Reichsmusiktage’ - an event orchestred by the National Socialists to promote what they considered to be the thriving musical culture in Germany under the Nazi regime. Part of this ‘festival’ included the exhibition by Hans Severus Ziegler, ‘Entartete Musik’ - Degenerate Music, an exhibition which set out to discredit the creators of music that the National Socialists considered ‘Un-German’ and so a threat to their moral standards and ideals. 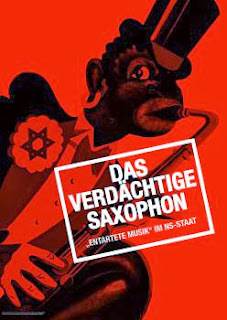 From January 7 - 23 the Tonhalle will be showing the exhibition ‘Das Verdächtige Saxophon - Entartete Musik im NS-Staat’ - The Suspicious Saxophone - Degenerate Music During the Nazi Regime. An exhibition, created by Albrecht Dümling in 1988, and expanded in 2007, that takes a critical look at this little known passage in musical and political history. The roots behind these ideals are detailed, as is which music was banned - and the 'reasoning' behind which genres of music, and which people were selected. This included everyone, not those who wrote or made music but also lyricists, critics, conductors, concert managers. Everyone who wasn't considered to be of the Arian race. Several of the musicians that were forced to flee Europe and take up work abroad are portrayed, and the global influence of this persecution that seeped into so much music, not just classical, but also popular and jazz, is shown. The world of film scores for instance, changed greatly when a persecuted Hungarian/Austrian composer was obliged to make a living in any way he could, and so when Korngold fled to the USA, he found his way to Hollywood and became an award-winning composer. Today he is considered one of the founders of film music. There will be 7 public tours in German, one in English and one in French. I am supervising a young team of most knowledgeable and enthusiastic musicology students from the Robert Schumann Music Conservatory and the Heinrich Heine University, Christina Klein, Elisabeth Wahle and Roland Ring, who will talk you through this exhibition. Certainly not your regular RhineBuzz event, but as always, a cultural tour that will be accessible and easily understandable. For me, a great challenge to offer you, both our regular and new RhineBuzz audience, new insights into subjects we often know so little about. So do join us for a most important and thought-provoking opportunity to take in this exhibition, where you can discover so much about a most disturbing period in history. This is an exhibition which has toured to over 60 countries. Deutsche Welle reported on this exhibition a while ago. You can only access the exhibition if you take part in a tour, or are visiting a concert. Cost of the tour is €5 per person. Each tour lasts 45 minutes with time for questions afterwards. Please send reservations for the English tour by January 11 and for the French tour by January 17.